This website is operated by War Riders. Throughout the site, the terms “we”, “us”, and “our” refer to War Riders. 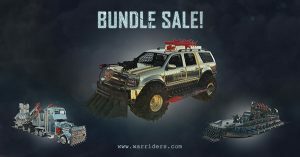 War Riders offers this website, including all information, tools and services available from this site to you, the user, conditioned upon your acceptance of all terms, conditions, policies and notices stated here. By visiting our site and / or purchasing something from us, you consent that you engage in our “Service” and agree to be bound by the following terms and conditions (“Terms of Service”, “Terms”), including those additional terms and conditions and policies referenced herein and/or available by hyperlink. These Terms of Service apply to all users of the site, including without limitation users who are browsers, vendors, customers, merchants, and/ or contributors of content. All products on this website are intended for legal use and may not be used, or discussed in a manner that is illegal. As the consumer it is your responsibility to know your local and state laws before making your purchase. Any governmental employee, agency, or agent must identify themselves to the operators of https://warriders.com upon their entering the site, and when ordering any products from our site. We reserve the right to request a scan of any customers photo ID for KYC verification and compliance. All of our products are traditionally and solely intended for entertaining purposes and may not be considered as investments or securities. The digital items offered for sale on our website are finished products that include a digital image (“Artwork”) and respective non-fungible token that resides on the Ethereum blockchain (“NFT”). These NFTs represent unique crypto-collectibles that are intended for the entertainment purposes only. It is your sole responsibility to know your state and local laws regarding digital items, collectibles and virtual currencies. By agreeing to these Terms of Service, you agree that you will not use our products for any illegal or unauthorized purpose nor may you, in the use of the Service, violate any laws in your jurisdiction (including but not limited to copyright laws). We reserve the right at any time to modify or discontinue the Service (or any part or content thereof) without notice at any time. Please note that the decentralized services (those that rely on the Ethereum network) cannot be shut down by anyone, except in the extreme case when the Ethereum network stops functioning. Certain products or services may be available exclusively online through the website. These products or services may have limited quantities and are not subject to return or exchange due to the decentralized nature of Services. We reserve the right, but are not obligated, to limit the sales of our products or Services to any person, geographic region or jurisdiction. We may exercise this right on a case-by-case basis. We reserve the right to limit the quantities of any products or services that we offer. All descriptions of products are subject to change at anytime without notice, at the sole discretion of us. We reserve the right to discontinue any product at any time. Any offer for any product or service made on this site is void where prohibited. This website accepts virtual currency Ethereum as the only method of payment. You may use MetaMask browser extension or any other compatible application to access the Services. We shall not be liable to you or to any third-party for any security breaches or loss of Ether related to the Services. You agree to exercise an extreme caution when using the Services and verify all transactions before submitting them. Subject to your continued compliance with these Terms of Service, War Riders grants you a limited, worldwide, non-exclusive, non-transferable license to use and display the Artwork with respective NFT information for the following purposes: (1) your own personal, non-commercial use related to War Riders (2) as part of a marketplace or third party website, provided that the marketplace or third party website cryptographically verifies the ownership of each NFT and ensures that the owner of each NFT is clearly identified and displayed. You are prohibited from modifying the Artwork in any way, including, without limitation, the designs, specs, or 3D models, except as a permitted by our Services. You may not use the Artwork to advertise, market, sell, or otherwise utilize it for your or any third party’s commercial benefit, except as expressly permitted in these Terms. You expressly agree that your use of, or inability to use, the service is at your sole risk. The service and all products and services delivered to you through the service are (except as expressly stated by us) provided ‘as is’ and ‘as available’ for your use, without any representation, warranties or conditions of any kind, either express or implied, including all implied warranties or conditions of merchantability, merchantable quality, title, and non-infringement. In no case shall War Riders, our directors, officers, employees, affiliates, agents, contractors, interns, suppliers, service providers or licensors be liable for any injury, loss, claim, or any direct, indirect, incidental, punitive, special, or consequential damages of any kind, including, without limitation lost profits, lost revenue, lost savings, loss of data, replacement costs, or any similar damages, whether based in contract, tort (including negligence), strict liability or otherwise, arising from your use of any of the service or any products procured using the service, or for any other claim related in any way to your use of the service or any product, including, but not limited to, any errors or omissions in any content, or any loss or damage of any kind incurred as a result of the use of the service or any content (or product) posted, transmitted, or otherwise made available via the service, even if advised of their possibility. Because some states or jurisdictions do not allow the exclusion or the limitation of liability for consequential or incidental damages, in such states or jurisdictions, our liability shall be limited to the maximum extent permitted by law. You agree to indemnify, defend and hold harmless War Riders and our parent, subsidiaries, affiliates, partners, officers, directors, agents, contractors, licensors, service providers, subcontractors, suppliers, interns and employees, harmless from any claim or demand, including reasonable attorneys’ fees, made by any third-party due to or arising out of your breach of these Terms of Service or the documents they incorporate by reference, or your violation of any law or the rights of a third-party. These Terms were last modified on March 22, 2019.